The event went off well with thanks going to Pine Rivers Memorial Bowls Club and staff for being able to hold both the morning Memorial Service and the Commemorative Luncheon on their premises. Senior school Essay winner Mr. Jason Lejack of Genesis Christian College and Ms. Megan Kennedy of Kurwongbah State School recited their winning essays at the morning service and proudly received their awards at the luncheon in front of about one hundred people including their respective families. Their awards were in the form of an oval medallion approximately 200mm by 150mmnd a ‘one off’ design that will never be repeated. 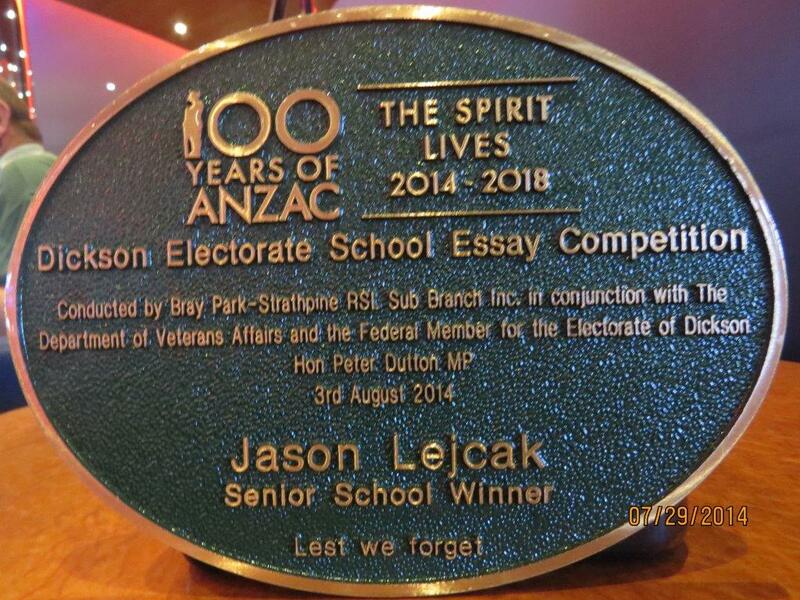 ‘I attended the Commemorative Service for the Centenary of the Start of Australia’s Involvement in World War 1, at Bray Park-Strathpine Sub Branch on Sunday 3rd August 2014. 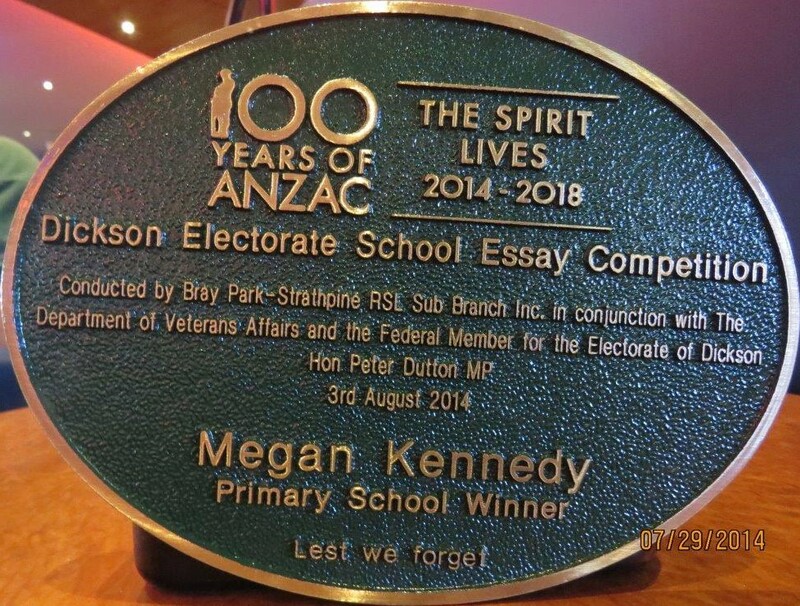 Not only was it great to see the community support for the Ceremony (local politicians, police, fire service, ambulance and schools) but also to have the privilege of listening to two inspiring essays being read by school students who entered our Essay Competition. 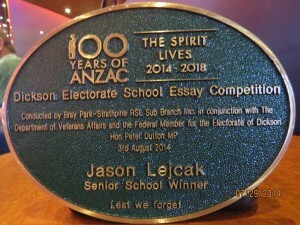 However what prompted me to write this note, was the interesting demographics of those sitting at the Luncheon table after the memorial service; it certainly did a great deal to dispel the image that only the “old and bold” white male ex-servicemen represents the RSL community. Of the six diners, three were male, three female: ages ranged from 15 to over 70; and backgrounds ranged from Australian-born attendees, as well as Samoan-New Zealand; South African; Scottish and Chilean-Australian families. All this made for entertaining and informative conversations around the table, which added to the already high enjoyment gained from attending this Commemorative Service. Well done to all involved in the support, planning and execution of this event. 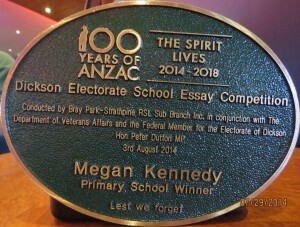 Many thanks go to the 100 Year of ANZAC Committee members Lin Lahey and Peter Spies and Sub Branch School Liaison Officer Doug Butler for taking on the task of delivering the thirty two plaques to the Dickson Electorate schools. what makes it harder on them is that some schools request for official presentations which take that extra bit of organizing. Well done committee! Bravo Zulu!